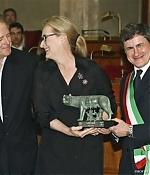 Today, Meryl was honored with the Marcus Aurelius award at the Rome International Film Festival. Pictures from the ceremony, as well as additional pictures from the “Julie & Julia” premiere and the “Meryl Streep Masterclass” interview session that took place right after the premiere, have been added to the Image Library. Meryl has also attended the festival’s awards ceremony a couple of hours ago, so check back for more!